This spring (May 8-11, 2019) The Superyacht Show, created by LYBRA, returns to OneOcean Port Vell in Barcelona. Split into several districts, from the seaside Barceloneta to the artsy El Born, there is plenty to explore while you are in town. Holly Overton reveals some top tips for navigating the city. From quirky tapas to Michelin-star dining, you’ll be spoilt for choice when it comes to the culinary delights of Barcelona. For lunch on the go head down La Rambla – a busy, central avenue connecting city and sea – to La Boqueria. Inside this vibrant food market hundreds of vendors sell colorful fresh produce to grab and go, from wood-fired pizza by the slice, paella aplenty, and paper cones filled with the finest Iberico ham. Can’t decide? Have a little bit of everything. Come dinnertime the first thing to note is that most don't eat until 9pm. If you want to eat like a true local, fill in the time by tucking into fanciful tapas dishes like no other at Llamber on Carrer de la Fusina. On the menu: parmesan fondue, salmon carpaccio with citrus fruits, dill yoghurt and ginger ice cream, and black pudding with grilled squid and its ink. Or, on the seafront there’s Michelin-starred La Barra serving up seafood tapas like amberjack cerviche, fried oysters and shrimp carpaccio. For more award-winning dining, there’s Disfrutar from the masterminds behind the legendary El Bulli, serving up a series of tasting menus with wacky dishes like crispy egg yolk, chocolate peppers and mango sorbet sandwich. Enigma, known as Barcelona’s most secretive restaurant, offers intimate dining with whimsical décor, cloud-like ceilings and artistic haute cuisine. Other recommendations include Enoteca Paco Pérez in the five-star Hotel Arts, Cocina Hermanos Torres where diners are seated around an open kitchen, and there’s also two three-Michelin star restaurants, ABaC and Lasarte. You can walk down any street in Barcelona safe in the knowledge that a refreshing mojito is never far away. But there are some bars that are not to be missed. 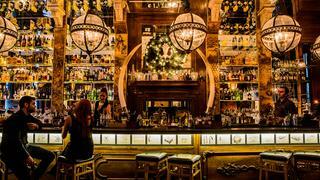 Discover your new favourite cocktail at Boca Chica, a glamourous bar in the heart of Eixample near the top of the Passieg de Gracia. Elsewhere, there's the trendy Barcelona hotel EDITION which was launched last September and houses Cabaret in its basement, where you’ll find a sultry lounge and bar, and a theatrical stage for evening performances. If you happen to be passing by in the day time head up to the 10th floor rooftop bar for refreshments with a view over the old city. First stop is the city’s most famous shopping street Passeig de Gracia, Barcelona’s answer to Fifth Avenue. The street is lined with high-end designer stores set between architect Antoni Gaudi’s avant-garde buildings with intricate paving stones underfoot. Like most of Barcelona’s main streets, the Passeig de Gracia leads to Placa Catalunya, a lively square in the heart of the city and a central meeting point for both locals and visitors. 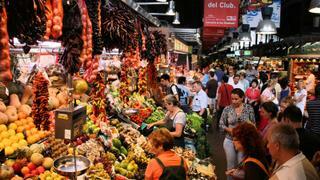 Alternatively, just a short walk from Port Vell you will land you in the fashionable El Born district. Home to some of the oldest buildings in the city, it is not only one of the most historic areas of Barcelona but also one of its liveliest. Narrow streets are filled with artsy bars and boutiques selling designer clothing, handmade shoes, art and more. Oenophiles should seek out Vila Viniteca, a wine merchant with more than 4,000 labels stacked from floor to ceiling. Sample Catalonia’s finest Cava or seek out the perfect red for sangria on board (then visit the deli next door for the perfect cheese accompaniment). No trip to Barcelona is complete without a visit to Parc Guëll, another one of Gaudi’s many masterpieces scattered throughout the city. The park sits a little further out from the heart of Barcelona but is just a short drive away. Stroll through colourful mosaic walls, quirky architecture and enjoy postcard views across the city and out to the Med. At the other end of the city you’ll find La Barceloneta beach. Spend an hour or two sunbathing on this kilometre long stretch of sand, take a stroll down the boardwalk, or dip in and out of the numerous cafes and bars sandwiched between the beach and Port Vell marina. After a long day exploring, indulge in a pick-me-up at The Despacio Spa at The One Barcelona Hotel. There’s an experience pool, Finnish sauna and a list of enticing treatments including a purifying enzyme facial and their signature massage with hot stones and a head to toe scrub leaving you revived and ready for the evening’s antics. Barcelona's Carrer Montcada in El Born is lined with a succession of Medieval palazzos, their majestic doorways opening to reveal their beautiful courtyards. Hidden behind an unassuming wooden door you’ll find Palau Dalmases where intimate, high-energy flamenco shows are performed every evening. 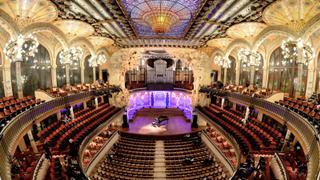 Music lovers should pay a visit to the exquisite Palau de la Musica concert hall. This architectural gem features magnificent marble staircases, detailed mosaics, and stain glass windows set in arches, showcasing everything from traditional Spanish guitar and flamenco performances to string quartets and world-renowned pianists. 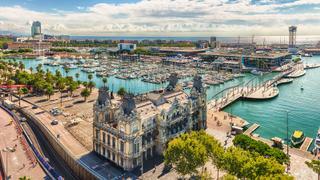 By boat: Barcelona’s OneOcean Port Vell, which can host superyachts up to 190 metres, will once again host the Superyacht Show and is just a stone’s throw away from the city centre. By air: Fly into Barcelona Airport and a 20-minute transfer will land you in the heart of the city. There’s also nearby Girona airport north east of Barcelona which is about an hour’s drive away.